Saturn’s moon, Titan, is the only object in the Solar System other than Earth known to have liquid on its surface. While most of the lakes are found around the poles, the dry regions near the equator contain signs of evaporated material left behind like rings on a bathtub that, when combined with geological features, suggest that the location of the liquids on the moon has shifted over time. “Today, Titan’s equatorial region is more like a desert—there is a huge sand sea of these phenomenal linear dunes and no lakes or seas,” Shannon MacKenzie, a graduate student in physics at the University of Idaho told Astrobiology Magazine by email. MacKenzie is the lead author of a study of evaporites, a mineral sediment that is concentrated and crystallized when saturated lakes or puddles on the surface dry up. Liquids are thought to have existed at the equator in the past, though only traces of evaporites remain in the region today. If Saturn’s moon ever hosted life in its past or present, these liquids would most likely have played a key role in its development. “Evaporites tell us where liquid has been in the past,” MacKenzie said. The findings, which were published in the journal Icarus, were supported by the NASA Astrobiology Institute (NAI) element of the Astrobiology Program at NASA. Evaporites don’t always create a ring around their lake. They require a closed-off body of liquid to be saturated with a dissolved solid. When the liquid evaporates, the solid falls out, unable to be dissolved by the remaining liquid, which is already full of the material. With no tributaries or other ways for the liquid to escape, the closed system is contained, making evaporation the primary method for leaving the system. On Earth, most evaporites form as salts dissolve in liquid water. 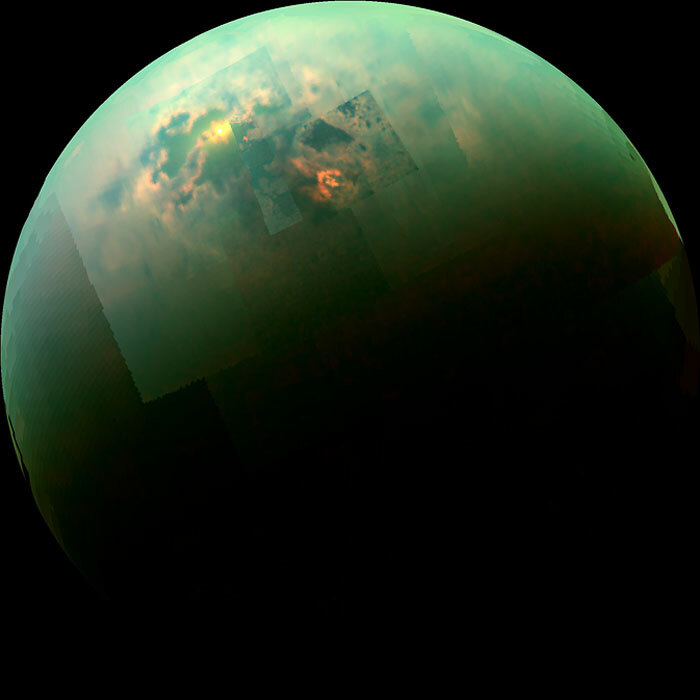 Titan doesn’t have liquid water at its surface; instead, its lakes and seas are dominated by methane and ethane. Salts are unable to dissolve in these bodies, so the composition of the evaporites are most likely solid hydrocarbons and nitriles, according to MacKenzie. “The game is the same, but the players are different,” she said. While lakes and seas abound at the poles—with substantially more existing at the North Pole than at the South—the equator remains a dry and desolate region, though it contains signs that liquid once flowed across the plains. Rounded cobbles, channels, and valleys dot the landscape, and there are signs of fossil seas that suggest long-lived bodies of liquid. 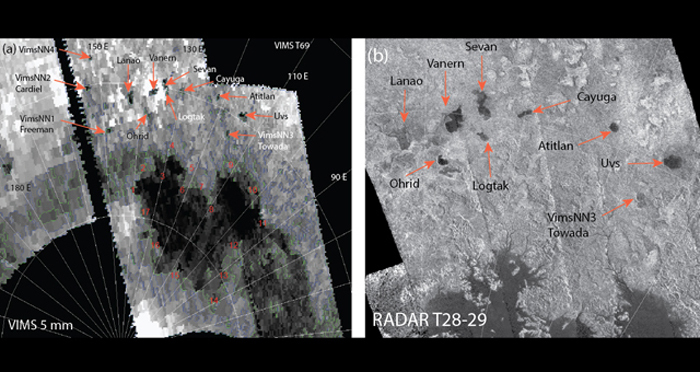 MacKenzie and her colleagues scoured images of the moon taken by NASA’s Cassini orbiter over the course of nearly a decade in search of hints of evaporites. They identified 28 features spread across Titan. While many of the new deposits are situated near existing bodies of liquid, the two largest single outcroppings of evaporites are at the equatorial regions, providing a stronger suggestion that liquid once dotted these now-barren zones. Previous research suggested that these areas may have been fossil seabeds that could have housed a combined total of 57,000 cubic kilometers of ethane and methane. Exactly how these evaporites look on the surface remains a mystery. Cassini’s Visual Infrared Mapping Spectrometer (VIMS) can resolve features approximately 0.6 miles (1 kilometer), enough to detect large patches of the material but not enough to see them in detail. “It’s really useful to develop an intuition for possible ‘ground truths’—what you might see on the ground of your planet of study, should you be so lucky to go—by studying what happens on Earth,” MacKenzie said. On our planet, evaporites come in a variety of forms. MacKenzie describes the material at the Badwater Basin in Death Valley as “rough, like a sidewalk,” while right next door in a region known as Devil’s Golf Course, a plain of evaporites form “crazy 1.5-foot- [0.5-meter] tall complicated structures, very rough and sharp.” In Bolivia, the salt plain of Salar de Uyuni “is fairly flat from frequent resurfacing in the rainy season,” she said. 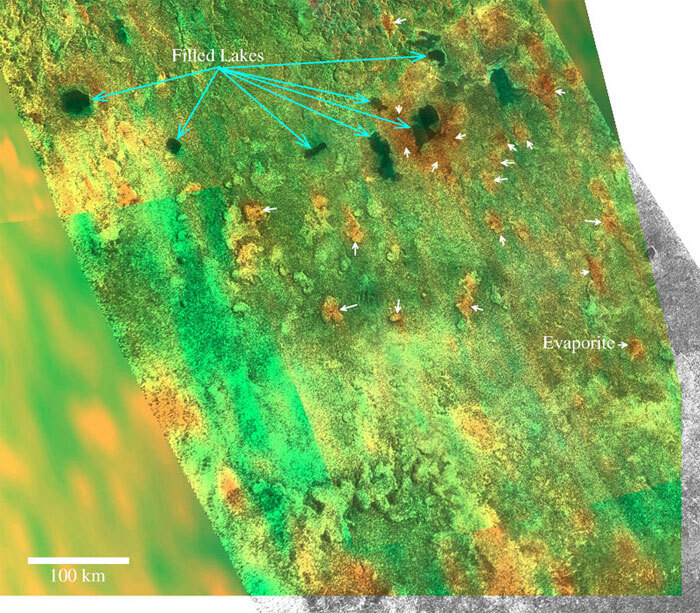 Near some of the existing lakes and seas on Titan, the material may show up as “bathtub rings” on the rocks just above the existing waterline. Similar rings appear around lakes on Earth as water levels drop. “If they exist, they could be much more chemically rich than similar structures observed on Earth, where they are composed mainly of calcium carbonate,” he told Astrobiology Magazine by email. Cordier, who was not involved in the research, also studies evaporite material on Titan. When we have the capability to glimpse the details of the left-behind materials on Titan, “we may find something on the diverse spectrum of Earth evaporites, or maybe something totally unique to the chemistry and geology of Titan,” MacKenzie said. Today, Titan’s North Pole contains the largest quantity of liquid on the surface. The lakes of the South Pole are smaller, and the equator remains bare of standing water, despite observations of rainfall. Some have suggested that rainfall carved the channels and valleys of the equatorial region, and that the central belt of the moon may never have housed lakes or seas. But the leftover material that MacKenzie’s team identified as evaporites suggests that the locations of liquid on the moon may have changed over time. One reason Titan’s liquid material may move over the moon may have to do with the changes in the seasons. As Saturn and Titan go around the Sun, the hemisphere receiving more direct sunlight changes over time. Cassini made its first flyby of Titan in 2004, which lasted nearly a decade in Earth-years but less than half a year to Saturn and its moons. While the seasons might cause some impact, they don’t appear to be enough to account for the massive changes. According to MacKenzie, scientists haven’t seen evidence of liquids moving from the north to the South Pole at scales large enough to be responsible for all of the left-behind material. That doesn’t rule out that seasons may play a role, however. Some scientists have suggested that over tens of thousands of years, the intensity of the summer season may change from pole to pole—sometimes the northern hemisphere receives more heat, sometimes the southern does—as Titan’s orbit shifts. “Whether or not that means there was more methane in the past to change the climate and allow or provide for more surface liquid is an area of active research,” she said.